Where are we going to eat next? 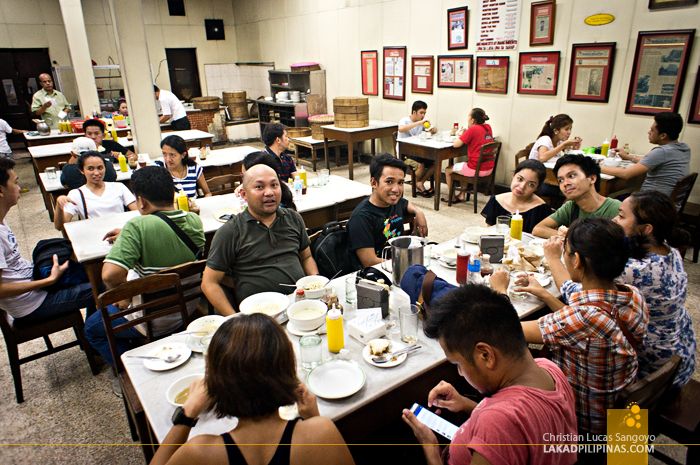 As if we weren’t already gut-bustingly full, my buddies were already looking forward to the next food place after passing through numerous street eats along Quiapo. Our tummies had already gone through Cagayan’s Best Pancit Batil Patong, Master Hopia Factory, Hidalgo’s crispy tokwa and siomai and Globe Lumpia House. 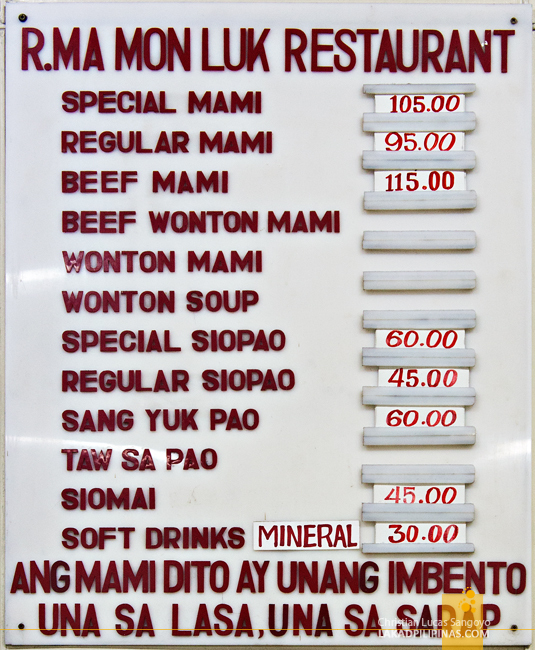 We were on a food rampage across the gritty streets of Manila and R. Ma Mon Luk Restaurant was the next one on our list. I’ve passed by this pioneering Chinese restaurant located along the crowded Quezon Boulevard in Quiapo uncountable times, but for one reason or another, I’ve never ever tried eating there. The closest I did was to sit along its antiquated open-aired hall and look at their menu. I found it too expensive at the time and I hurriedly went out before a waiter approached me. Now there was no turning back. Together with my travel mates from #teamredhorse, we sat down and actually ordered something at Ma Mon Luk, the restaurant that claims to have invented the first mami noodles in the country. 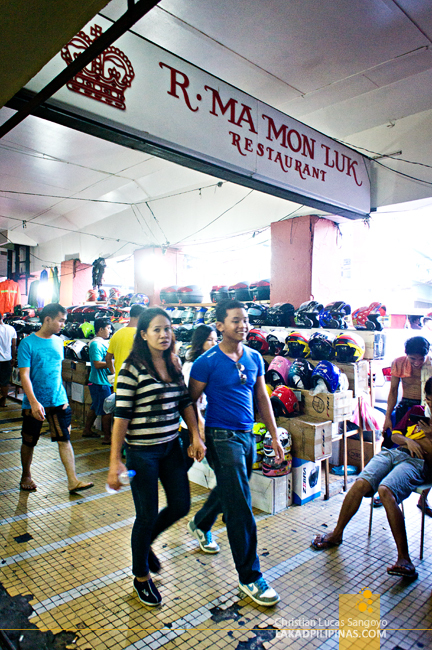 R. Ma Mon Luk is located on a seedy part of Recto and Quiapo, but don’t let that detract you from going there. The place is pretty safe as long as you’re street smart. I mean, keep your cell phones in your pockets, guard your backpack zippers and do not look lost. Through the five years that I’ve been going through the area, I have never once encountered anything untoward. 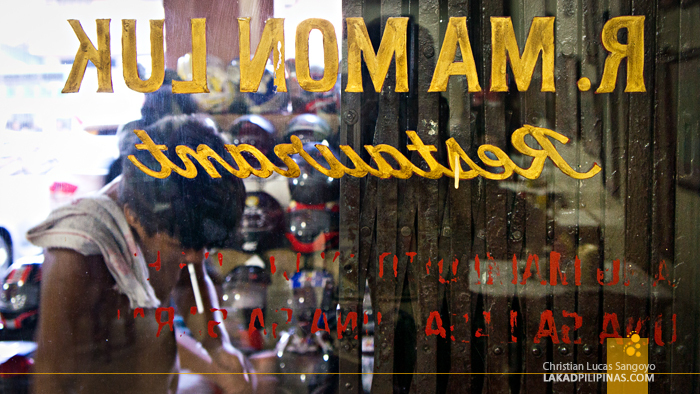 The famed restaurant started out with a single man, Ma Mon Luk, a Chinese immigrant from Guangzhou. 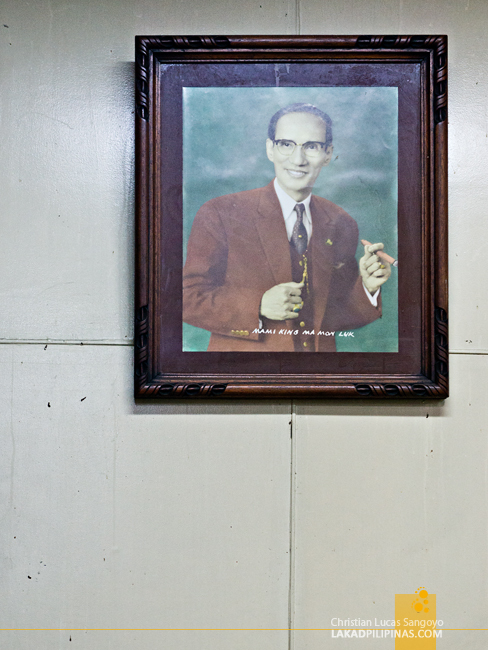 He arrived in the Philippines penniless, but by peddling his own version of chicken noodle soup along the streets of Manila on typical metal containers held by a bamboo pole, he was able to put up his first eponymously named restaurant in Binondo by the 1930’s. The rest as they say is noodle history. What started out as gupit, as he dubbed his noodles back then (since he would literally cut the chicken meat he would put into the steaming bowl of noodle soup with scissors) rose into national prominence. 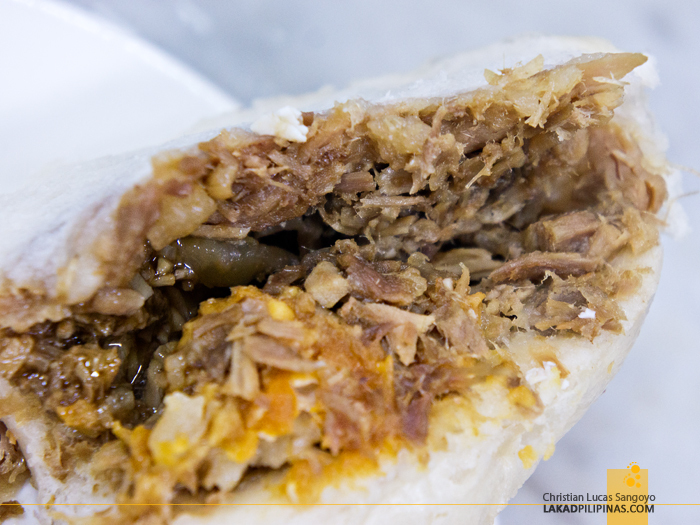 His version of siopao, with its secret sauce, also became renowned. And now here we were, almost a hundred years after his time, ready to discover if the legend still holds true. 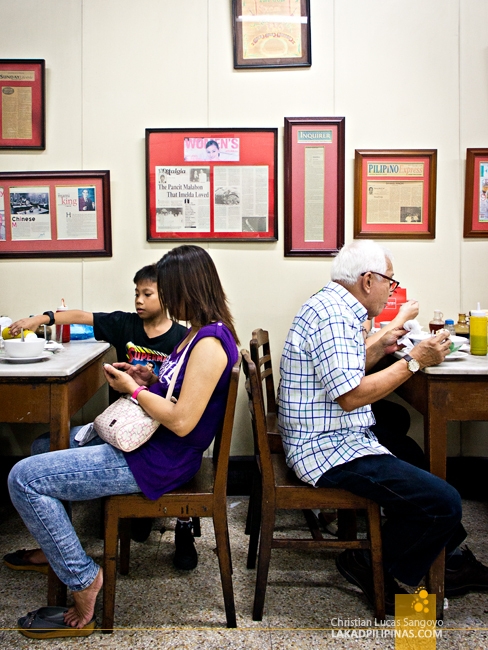 The restaurant itself is a throwback to Quiapo’s glory days. 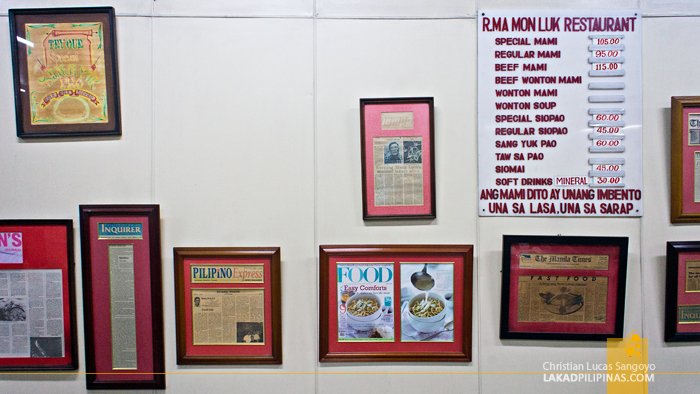 The floors are made of scrubbed white-washed tiles similar to our old house in Malabon, the walls are bare except for newspaper and magazine clippings singing praises about Ma Mon Luk, and the furniture are as legit as my grandma’s, wooden chairs paired with marble-topped tables. Their clienteles range from really old guys to kids, who were probably screaming for a Chickenjoy but were scooted here by their parents, who also probably grew up eating in this restaurant with their own nanay and tatay. 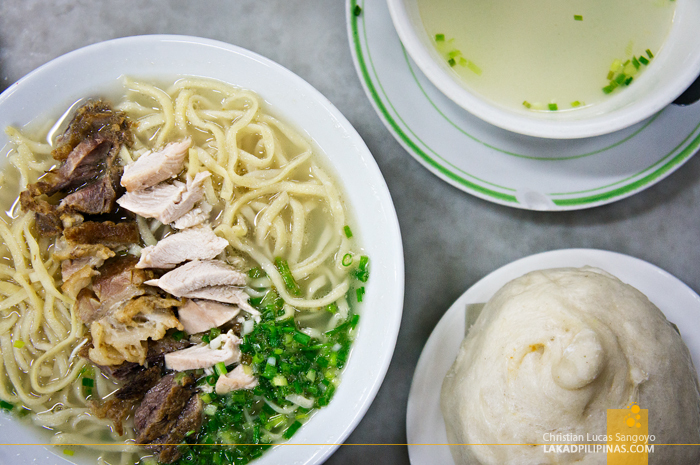 It wasn’t long before our orders arrived, a bowl of Special Beef Mami (Php115.00) and Special Siopao (Php60.00). We would’ve asked for a few pieces of siomai, but we were seriously full. The plan was to share the two bowls of mami amongst us, with each one having half a siopao to pair it with. The mami has a somewhat creamy and milky soup, which I find to be quite peculiar. The noodles were firm and topped with sliced chicken and beef portions. On first taste, I didn’t like it. It took a dash of pepper and a few shakes of siopao sauce (a thing we learned at Masuki, another classic noodle house in Binondo), before it actually tasted right for my palate. The chicken toppings were so-so, but the beef portions were quite flavorful. R. Ma Mon Luk’s siopao, however, was a different monster. It was love at first bite. 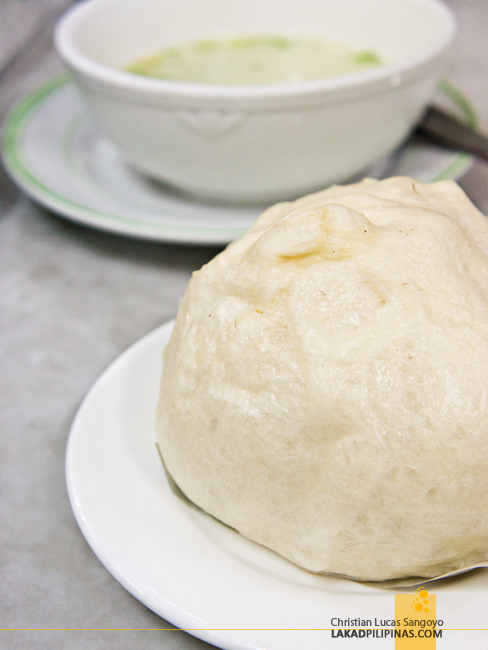 It was far better than any other siopao I’ve ever had, including those of the famous Kowloon House. I thought I could never eat again after finishing my half and declaring myself full, but when my seatmate wasn’t able to wolf down a fourth of his siopao, I gladly came to the rescue. It was that good. And the verdict? I can only burp with contentment. However, my husband and my son, its their first time @ Mamunluk. Happy talaga sa Ma Mon Luk! Although di talaga ako fan ng mami nila, yung siopao sobrang sarap! Sa Pinas lang mayroong "mami." Sa HK at mainland China ay hindi nila alam ang mami. Meron silang beef mi, chicken mi, etc. Pero wala silang chicken mami o ano pa man. Why? Ang "mami" ay gawa ni Ramon Ma Mon Luk. Ibig sabuhin ay the noodles of Ma or the MI of MA, Ma's Mi or MAMI. Para sa akin ay parang overpriced na sila. 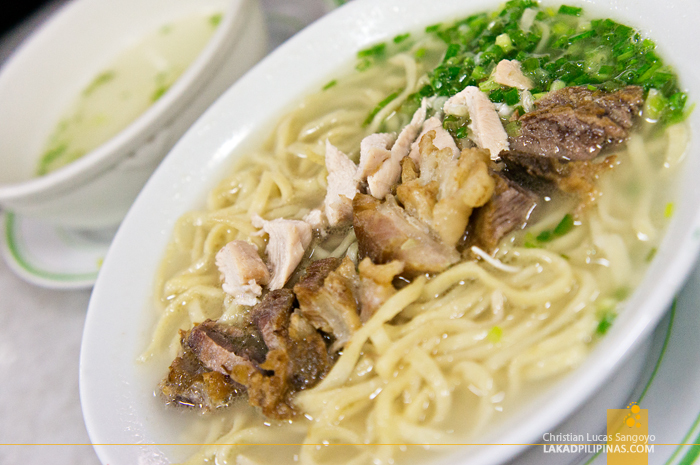 A bowl of noodles for Php 115? Oo nga't unli ang sabaw, pwede mong ipampaligo. Pero mahal pa rin. Kaya hinahati namin sa tatlo at tatambakan namin ng siopao sauce, paminta at kalamansi. Ang palaman ng siopao ay di ko na mawari - tinadtad ng kung anu-anong scrap pati cartilage at litid. Hindi ganyan dati. Pero kahit ano pa ang sabihin nila ay hindi ko ipagpapalit ang ambiance ng resto nila sa Quezon Blvd. Nanjan pa din ung maasim na amoy ng marble-top tables nila. Mga silyang isang tonelada ang bigat. Ang sabaw ng mami na lasang pinagpigaan ng basahan. At ung mga barya ng tinatakpan ng resibo para hindi mapamsin kasi hindi nakaugalian ng mga customers na mag-iwan ng tip. Nagkaroon pa nga sila sa EDSA malapit sa Kamias. Di ko lang alam kung nandun pa yung sa tapat ng Ateneo sa Katipunan - bahay yata nila yun. Patriot at nationalist si Ramon Ma Mon Luk. Nagsusuot siya ng Barong Tagalog kapag may okasyon tulad ng Idependence Day, Rizal at Bonifacio Days. 50 years na akong kumakain sa Ma Mon Luk. Pati ang dalawang anak kong lalake na sa Calamba pinangangak at nakatira ay adik na din ngayon sa mami't siopao ni The Great Ramon Ma Mon Luk.
. . . at dahil lumalaki na ang dalawang anak kong lalake ay hindi na kami kasya sa isang mangkok ng mami. Mami pa lang ay Php 345 na , eh, may tig-isang sipao at siomai pa. At merienda pa lang yan! Hi Khayel! I love your memories of Ma Mon Luk! Priceless!